Red Gingham Waxed Tissue is rated 4.7 out of 5 by 13. The Fourth of July is just around the corner and did you know that July is not only the month for those big red, white and blue celebrations, but it's also National Ice Cream month? 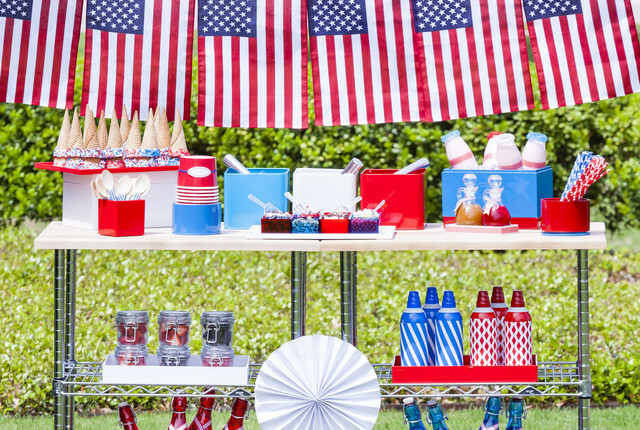 We love the idea of combining a patriotic party with a good old fashioned ice cream social! Fourth of July decorations made up from a creative combination of containers, jars and trays, coupled with the magic of decorative tape, transform our Metro Commercial Chef's Cart into a sweet display worthy of fireworks!